The current version of the prototype has many bugs, as will many version in the future. This is inevitable, all we can do is fix them as they come up and then move on. Some bugs and issues, however, do not want us to move on. Unfortunately there are some quirks with the prototype that I have not been able to fix yet and unfortunately get reported a lot. I would like to list the most common ones here so that you know you are not alone in your struggles and we are aware of the issue. Items will be taken off this list when/if they ever get fixed, but until then you just have to deal with 'em. Let's get started! * Even though the games works fairly well in modern browsers, it can still lag sometimes and has a really nasty crashing bug its tab goes inactive during a battle. If the transitions are too choppy you should lower your message speed in the "Options" menu, and if you need to switch tabs click the little pause button at the top of the battle window before you do (or wait until you're back at the main menu again). You've been warned. * Every single turn your actions are sent back to the server and the results sent back to you after being calculated. If your browser session somehow expires while you're in the middle of a battle (maybe you have aggressive cookie settings, maybe you left the battle idle for way too long, etc.) the entire battle will be ruined and you'll have to start over. Hundreds of robots will appear on-screen in a glitched out manner and you will not be able to do anything constructive so don't try. Reload the prototype and see if you need to log in again. * Slightly related to above issue, sometimes there will be a fatal error on the server and the battle will be unable to continue causing an endless "Loading..." screen. After a set amount of time, an alert will appear asking you if you want to resend your last action, but most of the time it will not work and the battle may need to be restarted entirely. This is obviously a game-breaking bug that should be fixed, but at the moment it's incredibly hard to diagnose. At the very least, any experience points earned in battle before the bug occurs will NOT be lost. Is it just me, or does the "Players" tab doesn't work, and all of the other tabs work just fine? @ThatOneEnderMan : Fixed, thanks for the heads-up! I don't know if it's just me, but it seems robots aren't getting a Weapon Energy discount for their own abilities, which means for example that Mega Man needs 2 WE to use the Mega Buster, and Elec Man needs a whooping 4 WE to use his own Thunder Beam! If I try to remove the ability and then put it back on, it shows the correct discounted WE ammount, but upon reloading the Robots tab or going into battle it reverts back to double the correct ammount. Also, it seems if you remove (NOT replace) an ability that's not the last on the list, some of the later abilities tend to dissapear afterwards. As much as I use either the Attack Capsule or the Super Capsule, my Ice Man's stats won't actually increase. They go up in-battle, but as soon as I get out of it the upgrade goes away, even tho Ice Man doesn't yet have Max Attack. Also, even though the Super Capsule is meant to increase stats by less than the other capsules (20% in each stat vs 30% in one), in practice the Super Capsule increases everything by MUCH more than the Specialized Capsules. I pressed the back button since it sometimes goes back to the menu, but this time it restarted the mission with all my current robots. 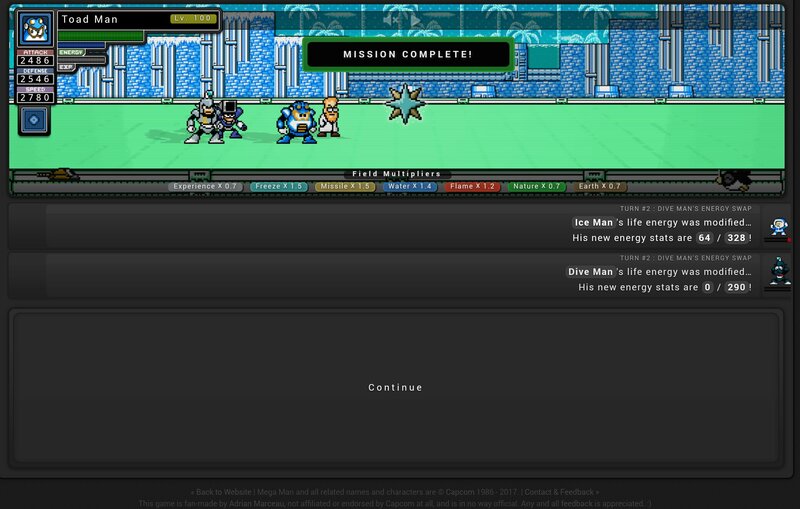 So Dive Man used Energy Swap with a defeated enemy, which in turn caused both of them to disappear. I tried to use Rain Flush again, but the mission ended once I selected it. So, has anyone noticed Octavio hacking Prototype? He's managed to use unobtainable bots and summon them too, breaking the database statistics. Goodness knows how he's managed to do this. Perhaps he replaced some of the MM3 bots? 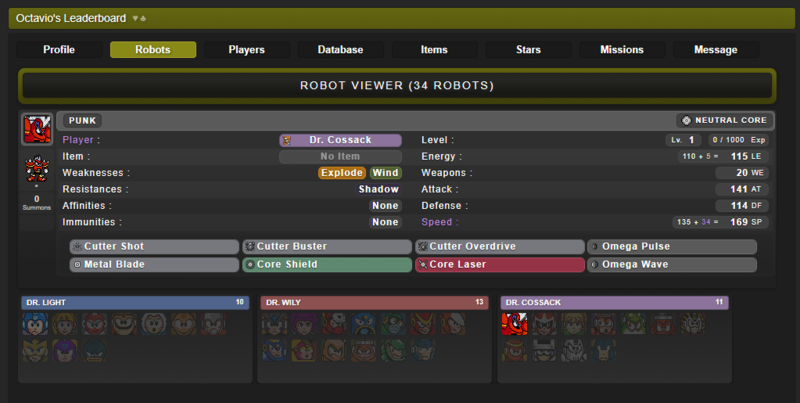 I wonder how others who play legitimately would react to seeing his unobtainable robots in Player Battles. ..And this can be an issue for the roleplaying forums and all that for, let's say, an attack that is half neutral. Isn't Neutral supposed to be just... Neutral? It's just a plain type on it's own, and it's not meant for any sort of alignment with other types. Though, None is a bit of a brighter shade than Neutral. I personally think having to use None if something's half-neutral gets kind of old after a while. @RotomSlashBlast : Hey that works, even if its slightly lighter. Thanks, man. @Shiver : I mean I guess so? But for what I was using it for (roleplay forums) it is a bit of an annoyance. So I was in the Wily Campaign and I tried to go against Heat Man and unlock him. I found it very difficult as Disco was the most underleveled on the team with Neutral moves, and Bass was weak to flame core RMs. So, I decided I'd wait 'til I unlocked the Transfer Feature and Cossack's campaign. Once I did, I transferred Proto Man and Rhythm to the Wily Campaign and faced off against Heat Man again. 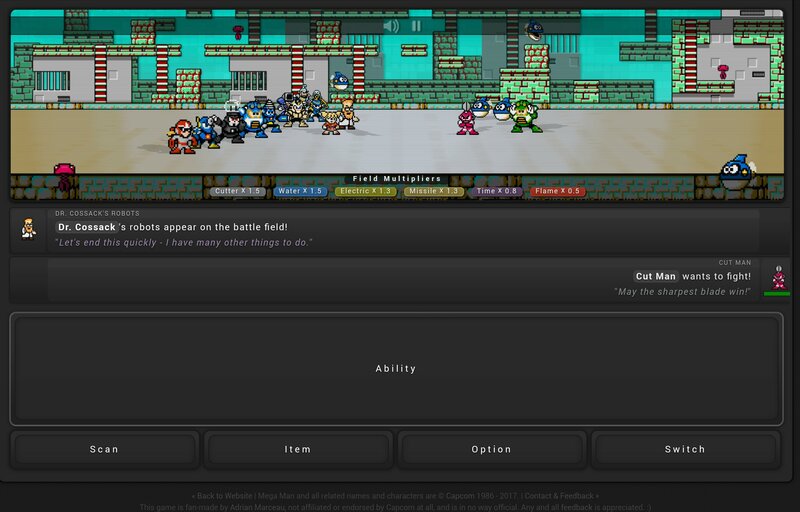 I killed him with Bass, Disco, Proto Man, and Rhythm. And all with neutral moves, but I didn't unlock him. Am I doing something wrong, is this a bug, or is it just not possible to get a Robot Master after you've completed their respective Campaign? EDIT: I decided to skip Heat Man until I got Proto Man to a good level. So, I transferred him back to Cossack, got him to Level 32, and just spammed Proto Strike against Heat Man again.